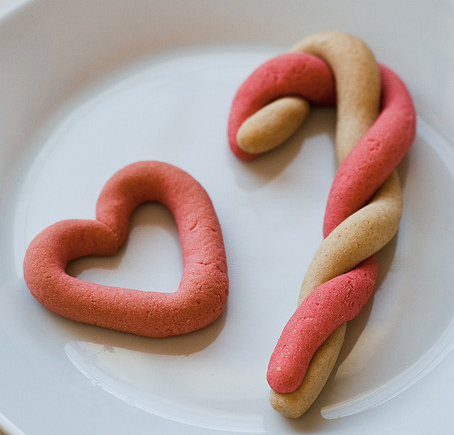 These adorable 'candy cane' cookies are fun to make, and have a delicious almond sugar cookie flavor. They make great gifts, or to spruce up a centerpiece! Beat together butter, powdered sugar, egg, almond extract and vanilla. Mix together flour and salt, and add to the wet ingredients, stirring until well-combined. Divide dough in half. Add red food coloring to half the dough. Roll even logs 1/2" wide of red dough, then white dough. Twist together and bend top to form cane shape. Bake on ungreased sheet for 9 minute at 375 deg. Can be sprinkled with a crushed candy cane and sugar mixture while still warm.